Some of the major companies in the global 3D IC market comprise Tezzaron Semiconductor Corporation, 3M Company, Taiwan Semiconductor Manufacturing Company, Ltd., Samsung, United Microelectronics Corporation, Xilinx, and STMicroelectronics amongst others. These players are set to bolster the global 3D IC market in the years to come. According to analyst at Zion Market Research, global 3D IC market was capitalized at almost USD 4.04 Billion in 2016 and is likely to create income of USD 10.90 Billion by 2022, developing at a CAGR of slightly more than 18.0% from 2017 to 2022. As per analyst at Zion Market Research, requirement for ICT and consumer electronics are likely to boost the development 3D IC market in the near future. Moreover, rising number of portable devices such as tablets, smartphone, or laptops are some of the major reasons to propel growth of 3D IC market. Rising need of 3D ICs in sectors such as servers & data hubs and military & aerospace sector along with increasing high-end computing market are also augmenting the development of 3D IC market. Various M&A by market players is set to boost the development of 3D IC market in the years to come. For example, in December 2017, TE Connectivity purchased Hirschmann Car Communication for commercial & automotive vehicle applications, thereby driving the growth of 3D IC market. On the basis of application, the global 3D IC market is divided into military, information & communication technology, and others including consumer electronics. Information and communication technology sector grabbed the biggest share of the 3D IC market and added up for almost 26% of the 3D IC market in 2016. It is chased by consumer electronics and military sector. ICT is also likely to carry on the same fashion in the years to come owing to the high acceptance of 3D IC integration tech. 3D IC market is divided based on the substrate employed as bulk silicon and silicon on insulator (SOI). SOI was the primary sector of 3D IC market and added up for biggest share of the global 3D IC market in 2016. Bulk silicon sector is likely to exhibit moderate development in 3D IC market in the near future. Asia Pacific obtained a bulk of 3D IC market in 2016. 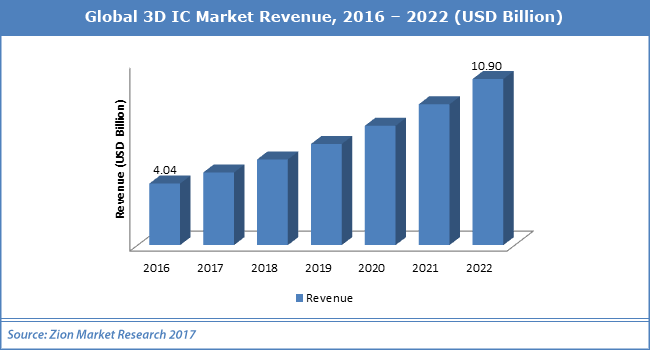 It added up for more than 40% share of the global 3D IC market in 2016. Asia Pacific chased Europe and North America in terms of growth for 3D IC market.